Reloop HiFi TURN 5 is a new £650 direct-drive turntable | What Hi-Fi? There’s a new turntable brand in town. Reloop HiFi has introduced its second turntable in the UK, the TURN 5. This follows the German brand's debut TURN 3 in 2016. The TURN 5 is a quartz-controlled, direct-drive record player that supports 33.3, 45 and 78rpm playback. Supplied with an Ortofon 2M Red cartridge, the S-shape tonearm is equipped with a removable headshell for easy cartridge changes. It also has vertical tracking adjustment. 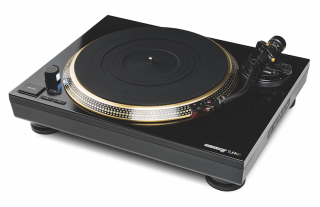 A dampening rubber base on the turntable system is designed to eliminate any unwanted resonance, and the ‘heavy-duty’ metal construction and shock-absorbing feet will further reduce vibrations. But is the TURN 5 any good? We hope to be able to review one shortly. The Reloop HiFi TURN 5 is available now, priced £650. The TURN 3, meanwhile, is priced £389.